The Japan Maritime Self Defense Force’s newest diesel-electric attack submarine was commissioned on March 18. The Japan Maritime Self-Defense Force (JMSDF) commissioned its tenth Soryu-class diesel-electric attack submarine (SSK), the JS Shuriyu, during an official ceremony that took place at the Kawasaki Heavy Industries (KHI) shipyard in Kobe in Hyogo Prefecture on March 18, KHI said in a statement. The new SSK was officially inducted into the JMSDF’s Submarine Flotilla 1, based in Kure, Hiroshima prefecture. The commissioning ceremony was attended by senior Ministry of Defense officials, high-ranking JMSDF officers, and defense industry representatives. The Shuriyu was laid down in January 2015 and launched in November 2017. 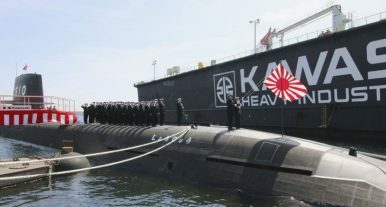 It is the fifth Soryu-class attack sub to be built by KHI and the 28th boat overall constructed by the shipbuilder since the end of World War II. Total construction costs of the new submarine are estimated at 53-56 billion yen ($496-502 million). The JMSDF plans to commission two more submarines of the class in 2020 and 2021 respectively, which will bring the total number of Soryu-class SSKs to 12. Notably, the first Soryu-class SSK fitted with lithium-ion batteries, the future JS Oryu, was launched in October 2018. The ninth Soryu-class SSK, the JS Seiryu, was commissioned in March 2018. The Seiryu was built by Mitsubishi Heavy Industries (MHI). It is the fifth Soryu-class and the 27th SSK built overall by MHI since 1945. Soryu-class SSKs are powered by two Kawasaki 12V 25/25 SB-type diesel engines and four Kawasaki Kockums V4-275R Stirling AIP engines for silent running. The boats have an estimated range of 6,100 nautical miles (11,297 kilometers) with a maximum surface speed of 13 knots and a subsurface travelling speed of 20 knots. The maximum diving depth of the sub is around 650 meters. The Soryu-class is fitted with six HU-606 533 mm torpedo tubes that can accommodate Type 89 heavyweight homing torpedoes and UGM-84 Harpoon anti-ship missiles. Next to bow-and-flank-mounted Hughes/Oki ZQQ-7 sonar arrays, the sub is also equipped with a towed array sonar capable of detecting ships over 70 kilometers away. The Soryu-class boats’ hydrodynamic design is based on the older Oyashio-class diesel-electric attack submarines currently in service with the JMSDF. It is (…) fitted with a computer-controlled, Swedish-designed X rudder to increase the submarine’s maneuverability when operating in shallow waters close to the seabed. It is also noteworthy that crew aboard a Soryu-class SSK is smaller than on previous JMSDF subs and usually consists of nine officers and 56 sailors. The Japan Maritime Self-Defense Force's latest diesel-electric attack submarine will be commissioned on March 18. Japan Commissions One of the World's Most Advanced Attack SubsJapan Launches 10th Advanced High-Tech Attack SubJapan Commissions New Attack SubmarineJapan Commissions New Stealth Attack SubmarineDid Japan Just Lose the Bid to Build Australia's New Subs?